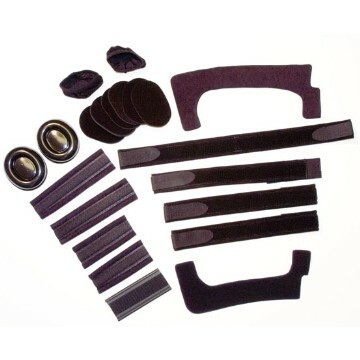 This replacement kit works with both the DonJoy Legend and the DonJoy Legend SE-4 knee brace. XS 13" - 15 1/2"
S 15 1/2" - 18 1/2"
XL 23 1/2" - 26 1/2"
XXL 26 1/2" - 29 1/2"
XXXL 29 1/2" - 32"
Is this kit for acl? Is there a way to buy just the straps and strap pads? Where on the DonJoy knee braces can you find the serial # ?? Are you referring to the D-rings, the metal rings on the side of the brace? If so, you will need to contact Customer Care to replace those rings. Call Customer Care at 800-336-6569 they are able to order individual straps and strap pads for you, we don't have those part numbers available on www.betterbraces.com. I would like to order 2 each replacement pad/strap kits with the CI version strap included. the standard legend ACL model replacement kits don't include the front strap just above the knee. Cell phone 619.249.1800.
this will replace all soft goods for this brace. Should you have any additional questions, please let us know.